Our beautiful tuffeau stone cottage is in the heart of the Loire Valley and is set within the grounds of a ﻿private château. Enjoy splendid tranquility - grounds and pool are exclusively yours - walk or cycle to our local village Brion - or bask in the sun by the pool. The cottage outbuildings include a stone barn and charming dovecote, once used to send messages by carrier pigeon to and from the château which, to this day, remains home to the Marquise d'Andigné. The cottage has 4 bedrooms, 2 bathrooms, a well equipped eat-in kitchen, child's highchair and cot, spacious dining room and lounge accommodating up to 10 people. 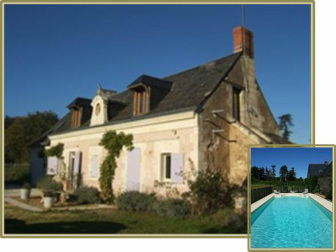 The cottage has a beautiful large patio with ample garden furniture and a large recently-renovated swimming pool. It's a quiet, restful location for a holiday, yet close to charming villages, towns, restaurants, vineyards and many sumptuous châteaux.